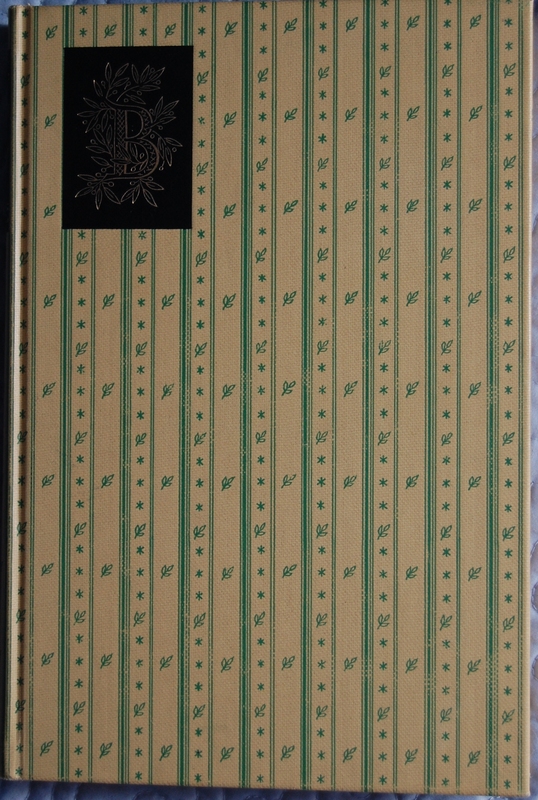 Front Binding – The Heritage Press took to their own devices from time to time, printing books that the Limited Editions Club did not. 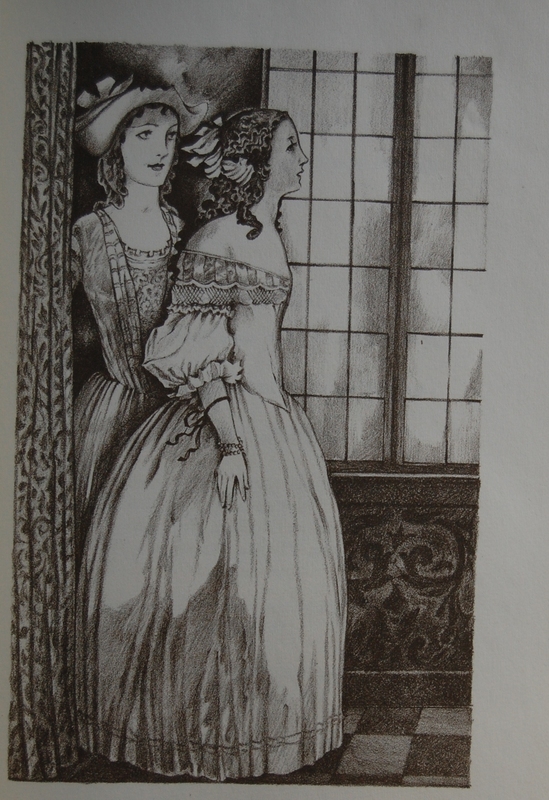 In some cases, these were alternative versions to books the LEC had published, like in the case of Salome. 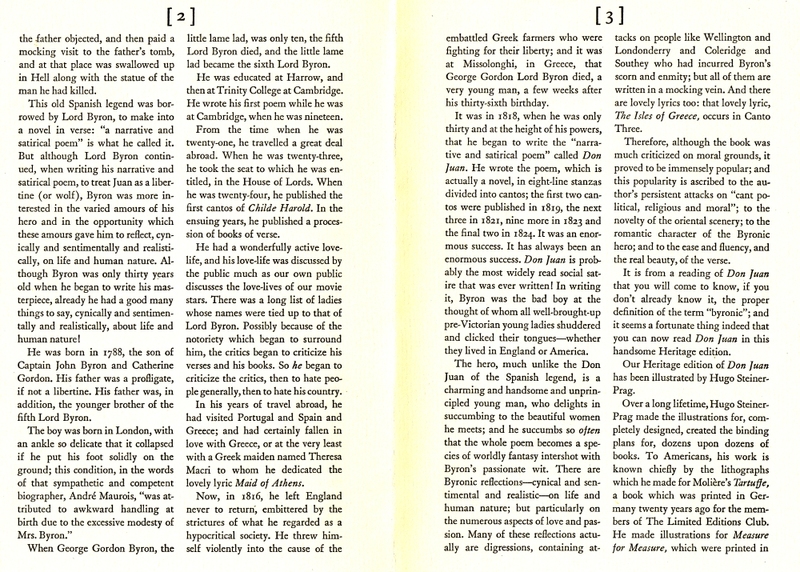 However, they also printed their own books that the LEC never did, and Lord Byron’s Don Juan is a prime example. 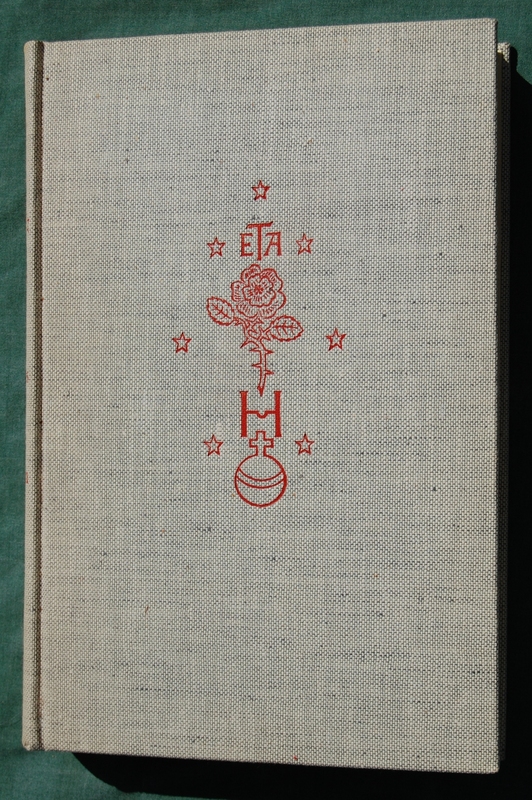 The book has a lovely yellow binding with a nice pattern designed and drawn by Hugo Steiner-Prag, the book’s artist. The Russell-Rutter Company performed the binding. 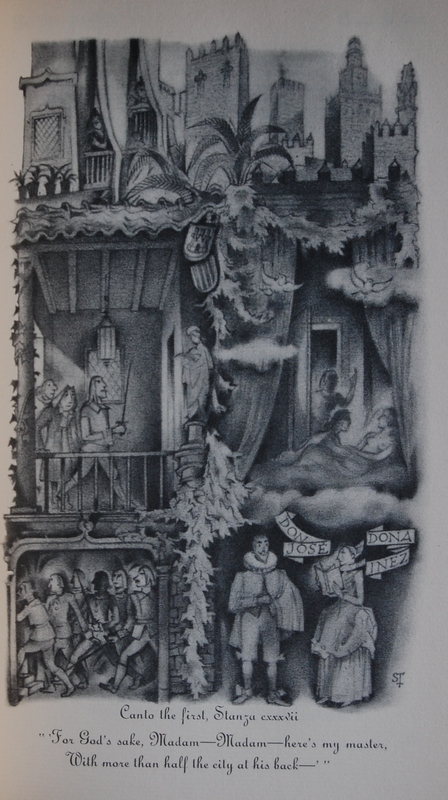 Steiner-Prag was also responsible for the lovely LEC Tartuffe I covered a while back, plus being the editor and illustrator of The Tales of Hoffman, as well as doing the LEC Shakespeare Measure for Measure. 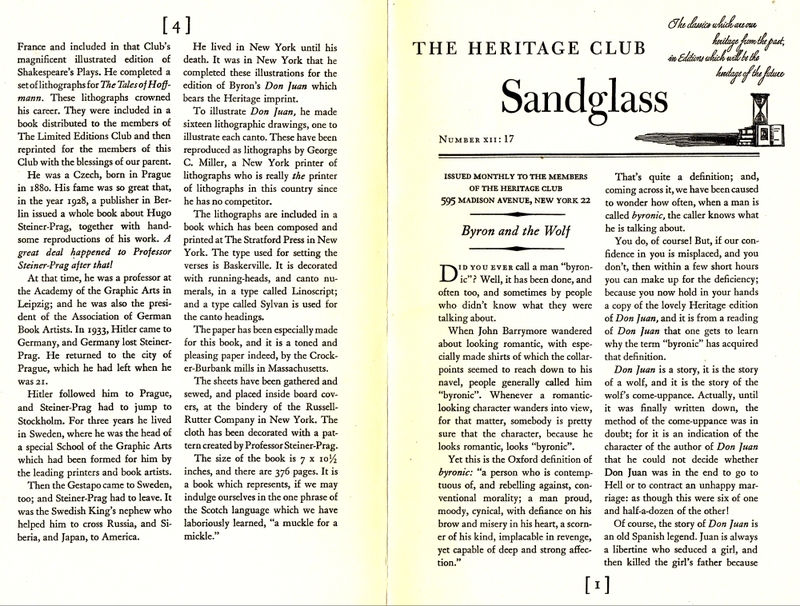 The Sandglass gushes about his works for the Club extensively, as well as covering his life fairly well, too. These illustrations are the last of Steiner-Prag’s work for either press, as he died shortly after completing the work for this volume. 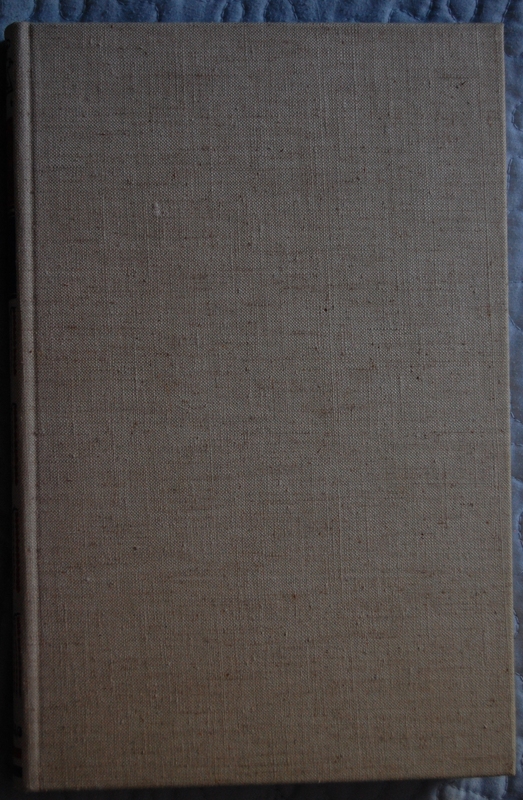 The Sandglass neglects to indicate the designer of this book – usually, that means that George Macy himself was responsible, but I’ll see if any of my fellow LEC collectors have any definitive info. The back board lacks the black block with the decorated “B”. Title Page – A rather attractive title page greets the reader upon flipping open the book. 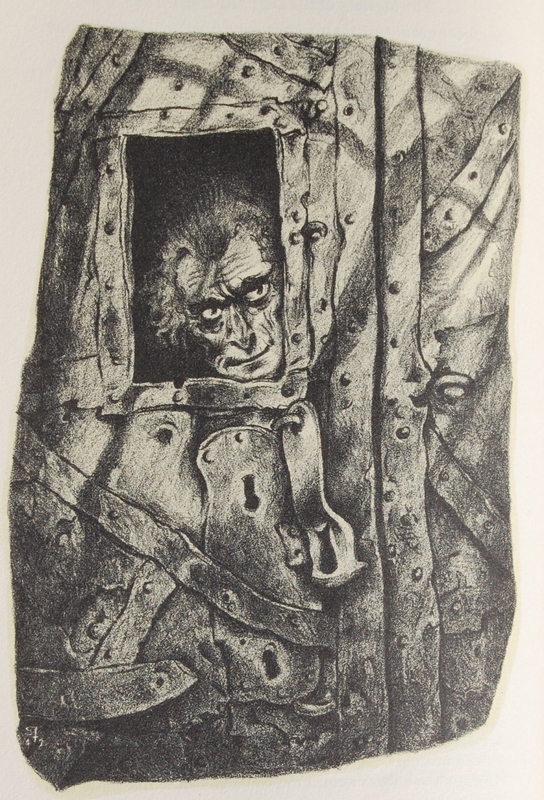 Steiner-Prag’s lithographs were reproduced by George C. Miller, who the Sandglass piles on this praise: “a New York printer of lithographs who is really the printer of lithographs in this country since he has no competitor.” Wow – compliments from Mr. Macy were quite handsome, indeed! 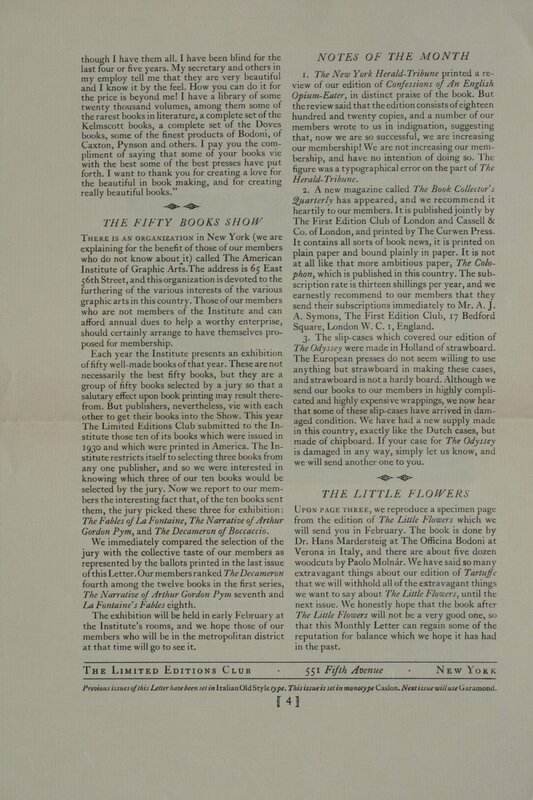 The book was printed by The Stratford Press in New York. The verses are in Baskerville font, while the running-heads and canto numerals are Linoscript, and the canto headings are Sylvan. 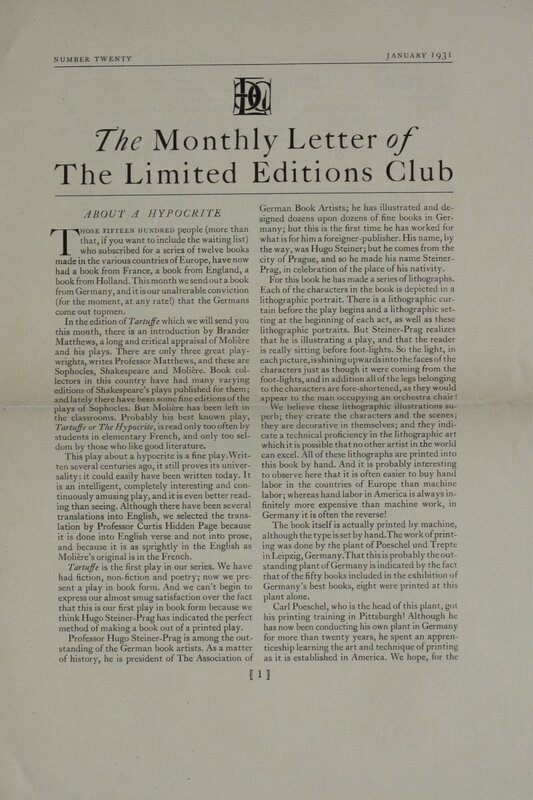 As par the course, specially-made paper for this edition came from the Crocker-Burbank Mills in Massachusetts. While the book’s title page fails to mention him, John T. Winterich offers a brief Introduction, and Paul Elmer More worked on some notes for the text that follow the poem. 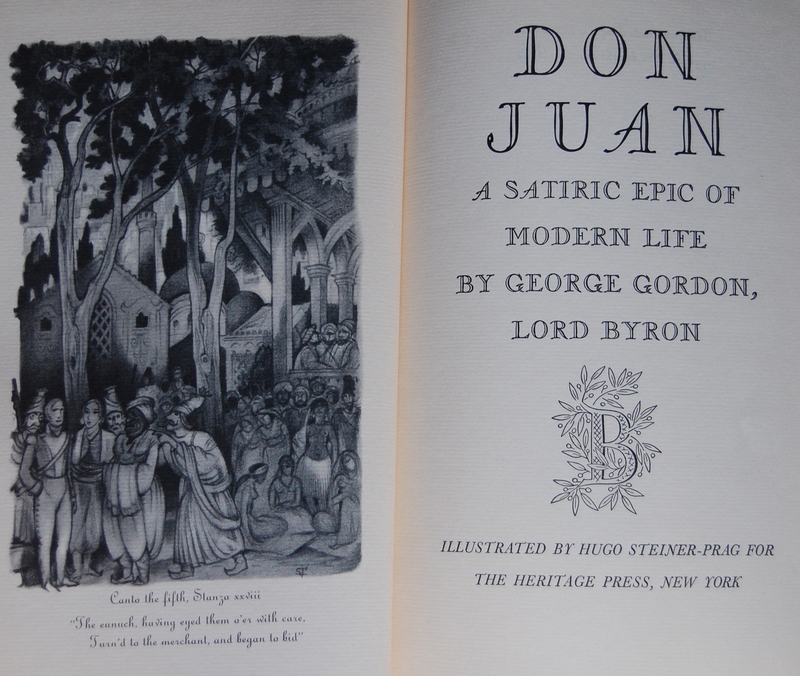 Byron’s work here is an epic poem about the popular literary figure Don Juan (Bernard Shaw fans may recognize the name if they’ve dove into Man & Superman, as Juan makes an appearance in Act III, and has often overshadowed the rest of the work). Byron may have wrote it into stanzas, but he intended it to be treated like a novel, if the Sandglass is to be believed. They also refer to this Juan as being unlike the Spanish legend, but I haven’t read it, so I can’t really agree or disagree with their claim. It is a social satire, and was hugely successful in his time. More about Byron and his “Byronic” writing style can be read in the Sandglass below. Page 24 – Steiner-Prag’s work is something that has grown on me as of late, making me appreciate his eye to detail and exquisite shading techniques the more I look at them. 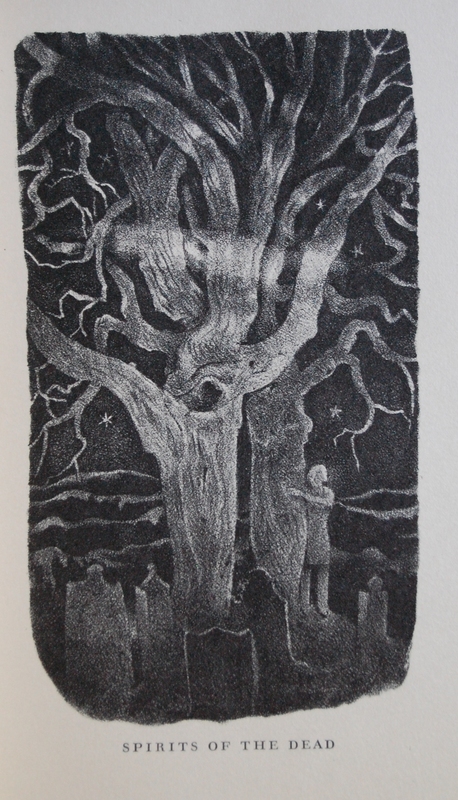 Page 56 – Another nice piece from the book. Really moody. Translated into Verse by Curtis Hidden Page, who also provides a Preface. Introduced by Brander Matthews. 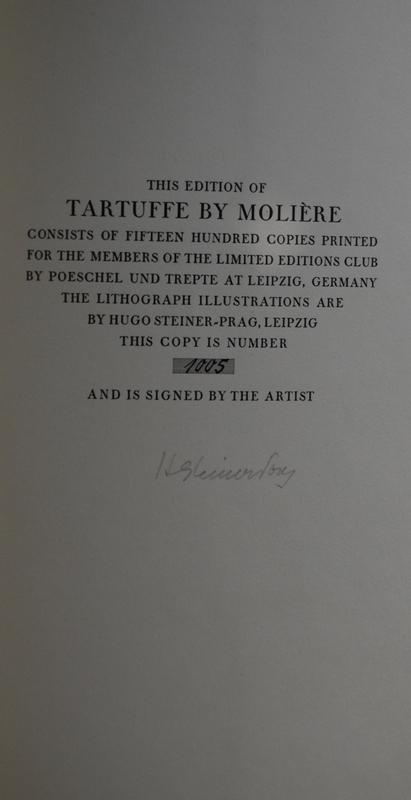 Tartuffe, designed as well as illustrated by Herr Steiner-Prag, lithos pulled by Meissner & Buch: Leipzig. 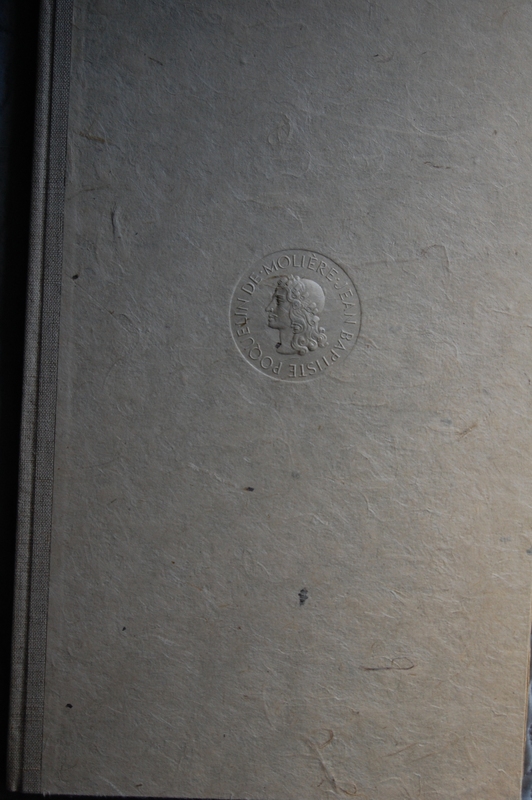 The binding is half natural linen, with mould-made Japanese paper sides. No Heritage Press edition exists of this (again, of the first 10 years of the LEC, maybe only half ever had reincarnations as Heritage press books (using the same illustrator, designer, etc. 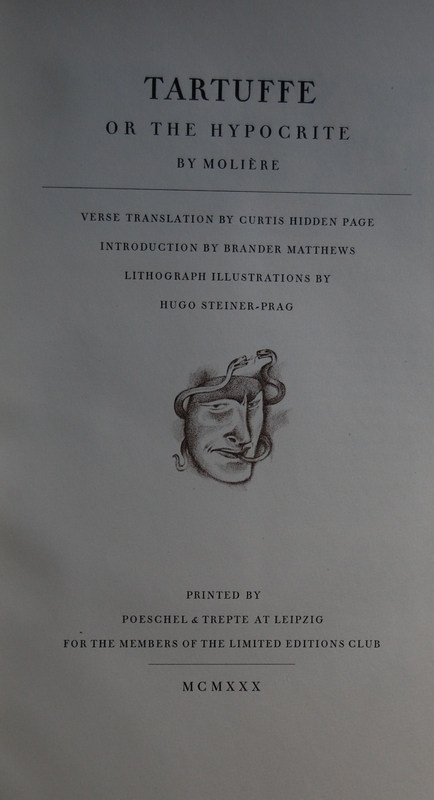 ), although many years later the LEC, and then the Heritage Press did a 2 play Moliere volume containing Tartuffe and The Would-Be Gentleman, in translations by H Baker and J Miller, and illustrations in color by Serge Ivanoff. 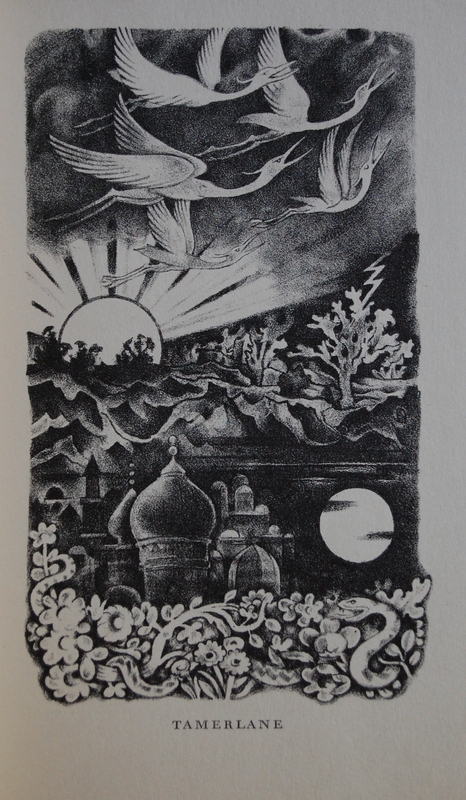 I can’t offer any comment on the merits of this translation as opposed to the one by Page, but I have to say I think Steiner-Prag’s black and white lithos far superior to Ivanov’s beautiful, but somewhat characterless illustrations for Tartuffe–although Ivanoff’s work seems better suited to The Would-Be Gentleman. 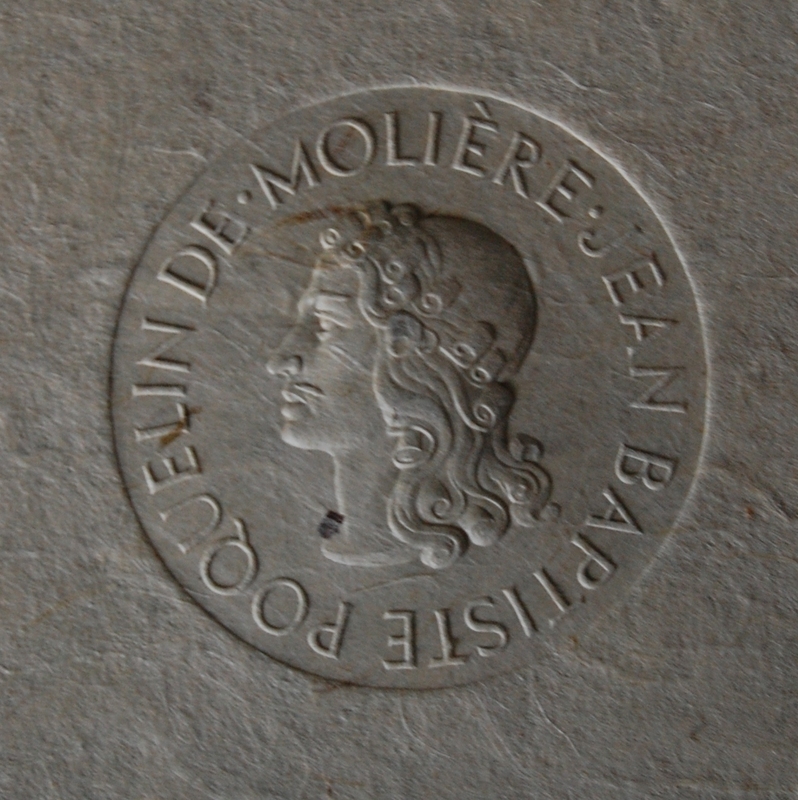 Below is a larger view of the relief. Spine – The text is upside down. 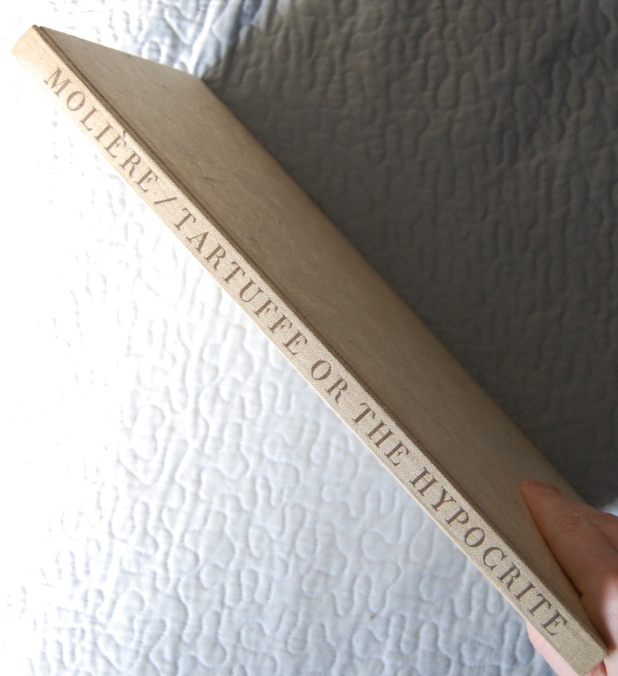 Moliere’s name is actually at the bottom of the spine when the book is correctly flipped to be read. 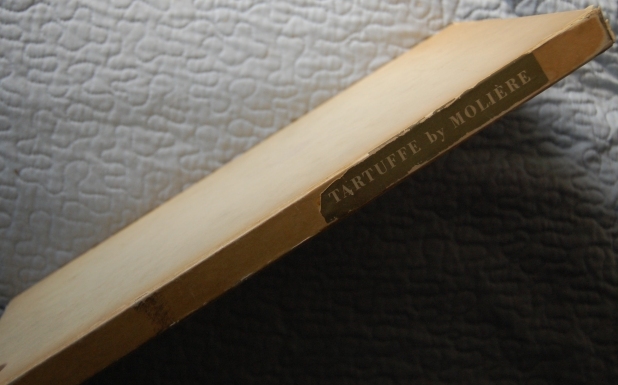 Title Page – The first Tartuffe the club put out was translated by Curtis Hidden Page (a man born for books, let me tell you), who also provides a small preface before the play begins. Before that, Brander Matthews gives the introduction. 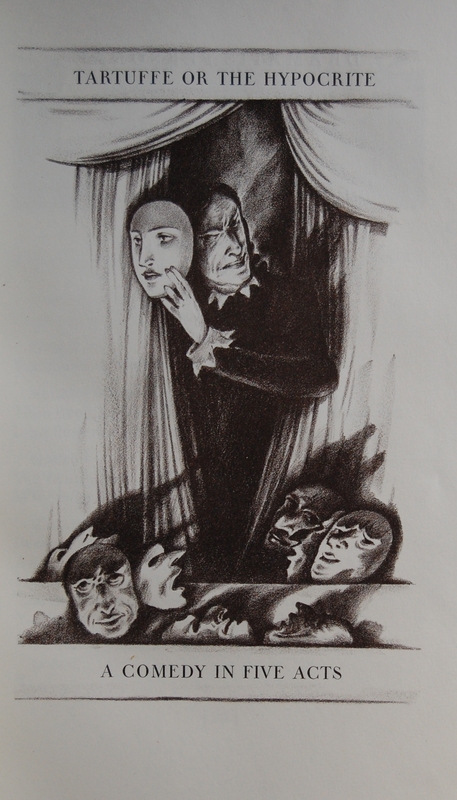 Hugo Steiner-Prag gives the comedy some most excellent illustrations in his first work for the Club. He did not return to the LEC until his Shakespeare commission in 1939, resulting in his rendering Measure for Measure for Macy. 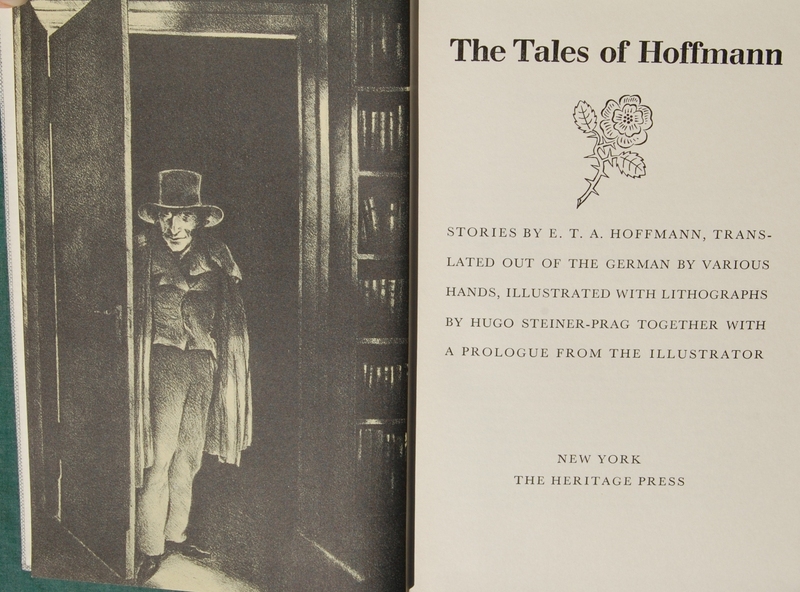 Next was The Tales of Hoffman (which he also provided the Introduction for) and Poems of Edgar Allan Poe, both in 1943. 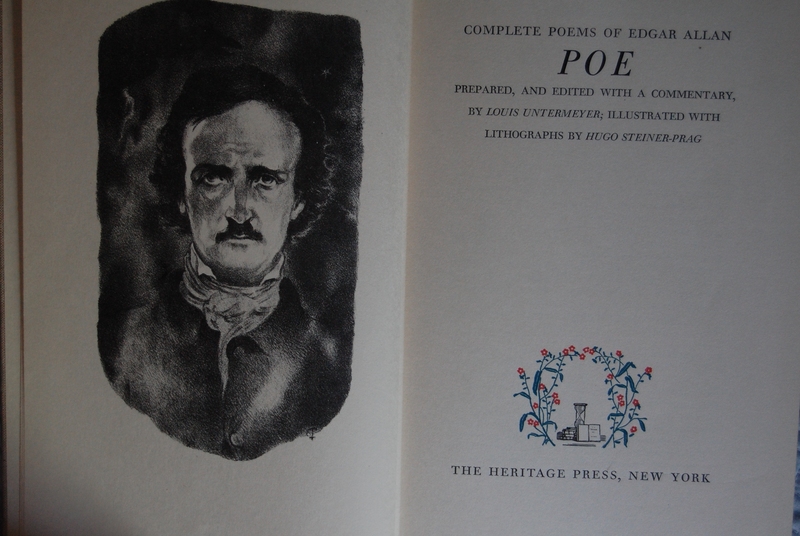 He passed away shortly after completing the work for Poe. 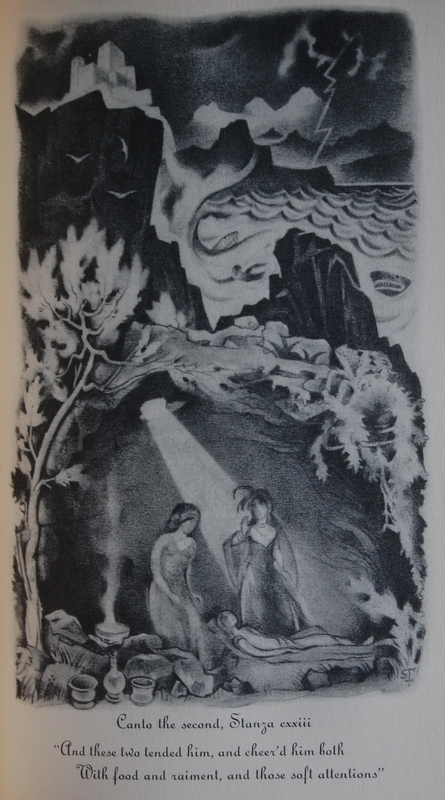 Lord Byron’s Don Juan was also illustrated by Steiner-Prag for the Heritage Press, also in 1943. A short but brilliant collaboration, if you ask me. This particular book was printed by Poeschel & Trepte in Leipzig, Germany, which also happened to be where Steiner-Prag resided. Signature Page – Here’s my limitation number: 1005 out of 1500. Steiner-Prag’s signature is in pencil (sorry for its faintness). 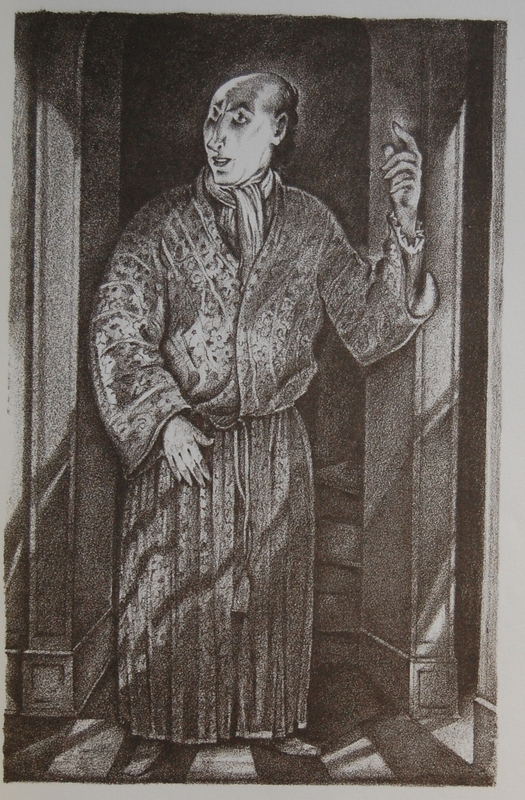 Introduction – A moody piece of the play’s lead, Tartuffe, a man with “many faces”. 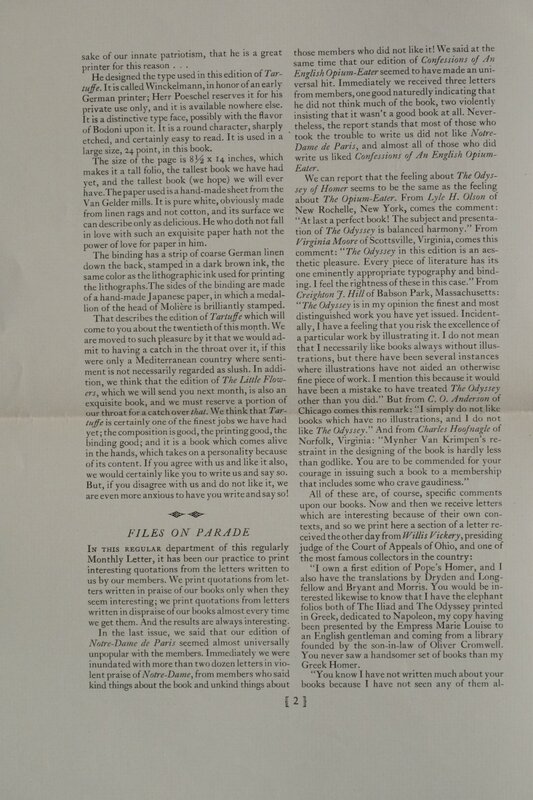 This page is right after the Introduction and Preface, preceding the play’s beginning. 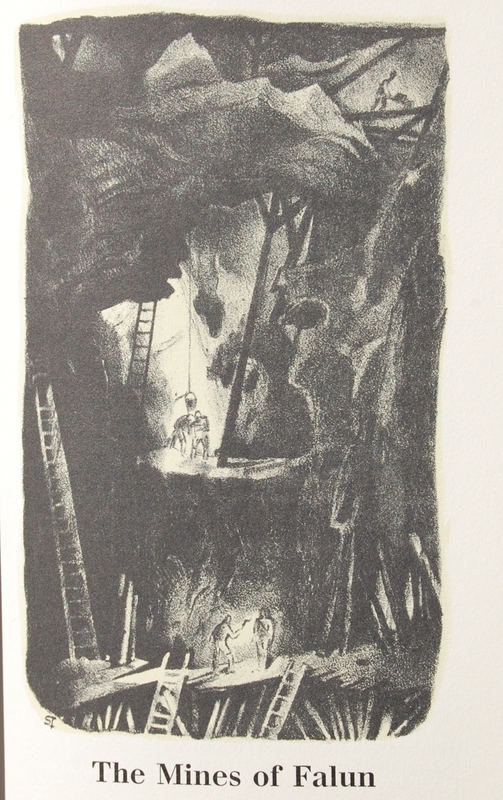 Page 41 – Steiner-Prag was brilliant with lighting, as is evident here. Page 57 – My favorite piece in this book. Personal Notes – Purchased at Moe’s in Berkeley for $25, but it was not my first exposure to the book. My favorite shop of all in Monterey Bookhaven (now Old Captiol) had a copy that a dog had unfortunately sunk its teeth into the top right corner, but I had to argue with myself not to buy damaged goods. The binding was just that captivating. This copy has no chew marks, and was wrapped in a sufficient piece of butcher paper with some tissue protecting the relief from harm. The slipcase is a little battered, but the book is relatively unscathed. Lucky me! I’ve read some of Tartuffe, as well as watching the Gerard Depardieu film, so I have some familiarity with this play, but not as much as, say, Macbeth or Cyrano de Bergerac. I’ll have to reread it soon! And be sure to check out the post on the later printing! Page 3 is omitted due to it being a preview of a later book. You are currently browsing entries tagged with hugo steiner-prag at The George Macy Imagery.